As A Canadian, Would You Need To Be Concerned? About one-third of Canadian deaths are because of cancer (see pie chart). Over 2 out of 5 Canadians are going to develop cancer in their lifetimes, and it can happen anytime. Over 500 Canadians are diagnosed with cancer everyday. Over 200 Canadians die from cancer everyday. 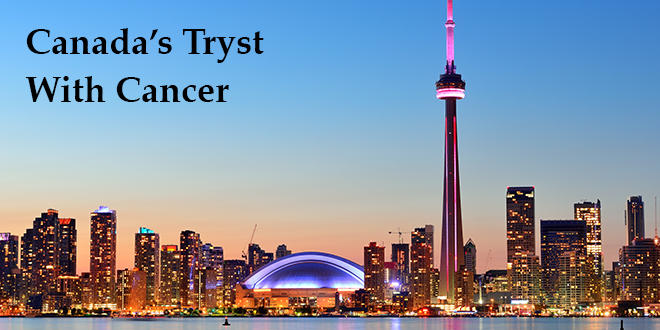 About 2.5%, or 1 out of 40 Canadians, is living with cancer today. Nobody wants to be a part of these statistics. However, the reality is that we cannot control that. All we can control is what we do if it were to happen to us. The worse the statistics, the more likely it will. That is why knowledge is half the preparation. Only 37.5% of the average Canadian’s drug costs are funded by public health insurance. The rest comes from either out-of-pocket or, if the individual has been proactive and willing and able to pay, private insurance plans. The average cost of a single course of treatment using current cancer drugs is $65,000. Most of these treatments, especially the more advanced ones, are not covered by insurance. And most treatments require more than one course, often with a more advanced drug, as the cancer progresses. Average cost for take home drugs is about $20,000 a year, which continues for as long as the patient is alive. In other words, the patient is limited to a small set of treatments approved by the health system and gets surely and steadily pulled into the average statistics of cancer. And this is also not even considering the prudence of opting for conventional treatments as opposed to safer, non-toxic alternative treatments. As a Canadian, what one must understand, is that the public health system is designed to meet the average needs of a patient. As the government looks to create a financially viable health system that makes efficient use of tax payer dollars, something has to give. As a result, budgets that are not realistically tuned to the huge financial needs for the treatment of cancer patients result in only limited treatment options. That is why the health system very strictly points patients to only certain treatments, and literally forces them to take actions that may not be what they want to take (see quote above to the right). As a Canadian patient, wait times for treatments can be staggering. The data for the bar graph to the right is taken from the Canadian Ministry for Health and Long-Term Care, pointing out average wait times for major surgeries and imaging procedures related to those surgeries. For example, a breast cancer patient would have to wait 126 days (about 4 months) to get an MRI, and then another about 5-6 months for a surgical procedure. On the average – some may have to wait longer. In a cancer patient’s calendar, 5-6 months is a long period of time where many adverse changes can happen, very rapidly. Treatment delayed here, is indeed equivalent to treatment denied. How Can Hope4Cancer Help Canadian Cancer Patients? No Chemo or Radiation. Our treatments largely focus on providing chemo and radiation-free treatments to patients, ensuring that you are not increasing the toxic levels in your body. No Wait Times. You can start treatments as soon as you can travel to us. Very Reasonable Cost & Unbeatable Return on Investment. At a cost that is much lower than the cost of a single chemo treatment, our patients receive a complete treatment program with multiple treatment options, up to 3 weeks of 24/7 in-patient care at our Mexico facility, support from our Home Program Support team once they return home, complimentary re-visits to the clinic offered every 3 months for up to one year, equipment to go along with their assigned treatment (Sono- or Photo-Dynamic Therapy) and more. A huge value is that they will be treated for the underlying cause, not merely the symptoms – giving themselves the opportunity to root out the problem once and for all, without adding more toxic substances and radiation into their bodies. We Understand the Challenges. Having treated hundreds of Canadian patients, we understand the particular issues our Canadian patients face in dealing with their health system, and we can help find solutions around them, as long as the patient stays steady with their treatment protocol. Can’t Travel? We Have Options. If the patient cannot travel, our surprisingly affordable Traveling Physician Program or our specialized home only programs might be a good fit. If you are an interested patient, please discuss this with our patient coordinator and our doctor to see if this is a viable option for you. You can contact Hope4Cancer through the form on the right.